I know, I have been gone for far too long. Let’s just leave it to too many projects in the works, and two seasons of unusually hot weather combined with summer drought that kept me in the gardens for hours every day. I am not in the least a hot weather kind of person, so after working in the gardens I would be totally spent. Two years of record heat and lack of summer rains (after an incredibly wet spring!) 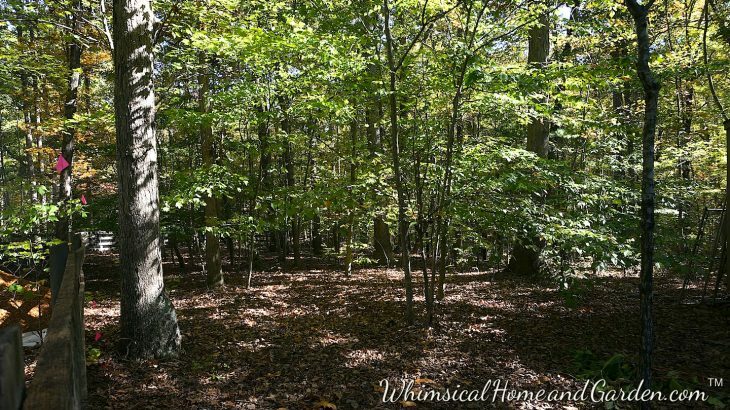 the seasons this year presented challenges in keeping plants, shrubs and trees alive. In my county we are still on water restrictions, and although I am on a well, I am always keenly aware of taking conservation measures. 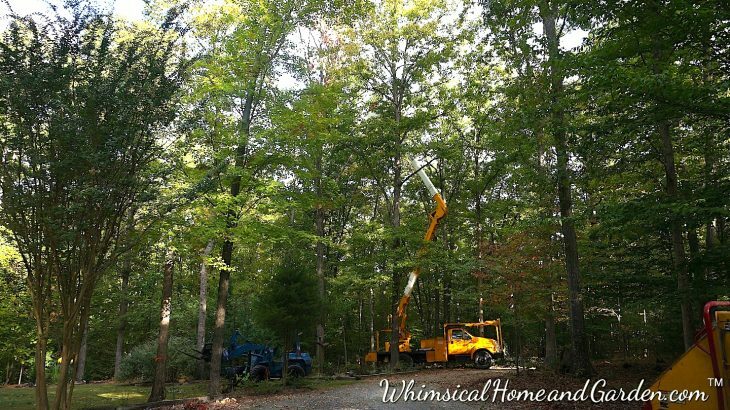 We lost two huge oaks this year, each 65- 75 feet tall, right on the heals of two from last year. 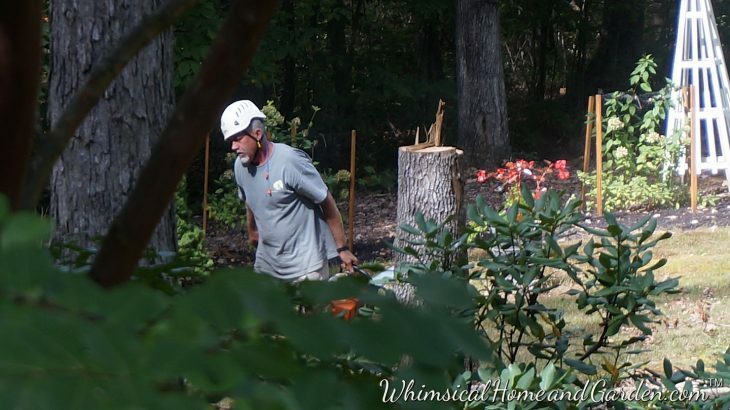 We also lost many mid sized trees and a couple of specimen trees and shrubs. It always breaks my heart to see any tree die. We have to keep Brock, our tree expert, on speed dial! Brock has been amazing to work with all these many years. 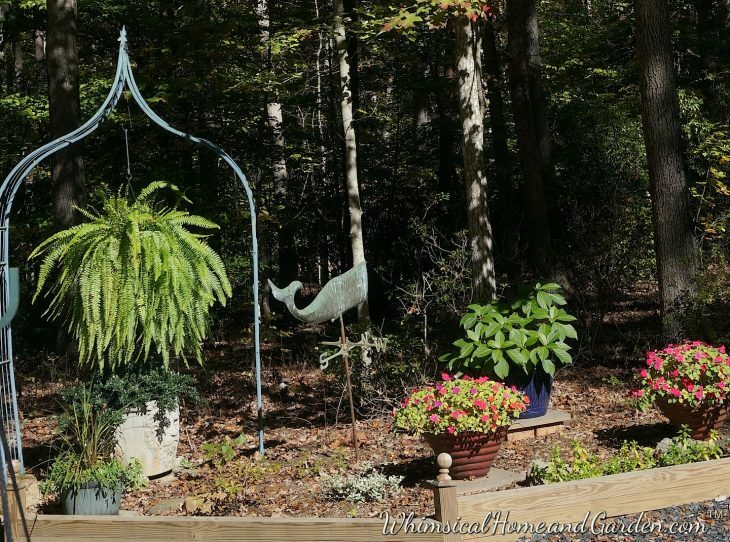 Not once has he damaged garden beds, garden sculptures/decor or even the lawn. When he leaves you hardly know he has even been here. We are so lucky to have that kind of expertise. 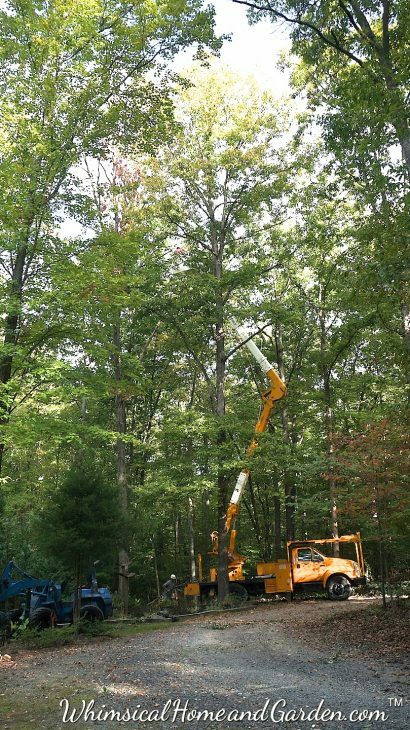 That crane was able to bring Brock and his son-in-law only near the top of the tree. They had to climb to saw the upper limbs. 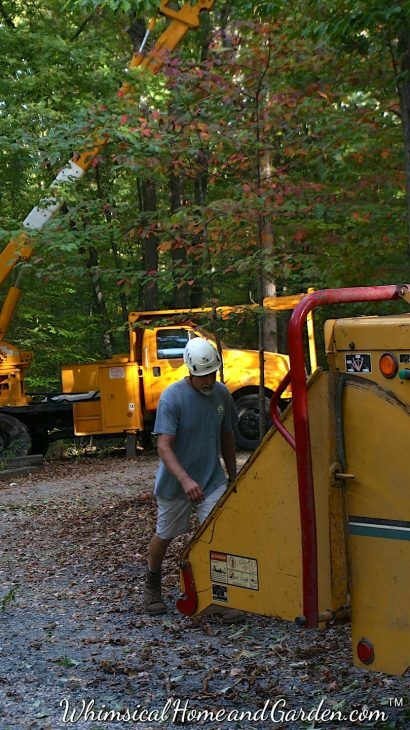 The chipper makes short work of many huge limbs. The stump from one of the trees near the path that leads to the creek and river. That’s Brock hauling limbs. This gives you a little bit of an idea as to the height of these trees. 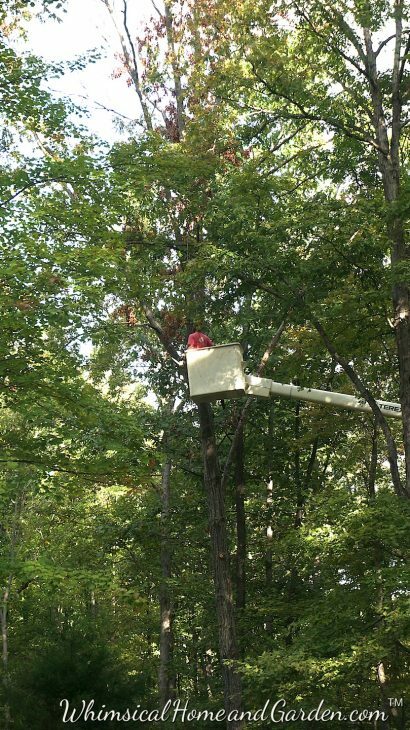 You can just see towards the upper left the dead limbs of an oak tree they are trying to get to. Here is a closeup of them getting into position to begin to take this tree down. What is especially surprising is, that after a couple of years of few or no acorns, this year, despite no rain, the oaks produced a record crop. There are so many, that KBJ is raking them and using a wheelbarrow to take the compost pile. There are more acorns than grass! Have no worry, the acres of woodland will supply more than enough for the wildlife. Another interesting but concerning observation is that the birds have dwindled in numbers over the summer. I have the feeders back out, but nada except for the woodpeckers and a few others. I really miss them. Well, let’s just get back to it. I have soooo much to share with you. 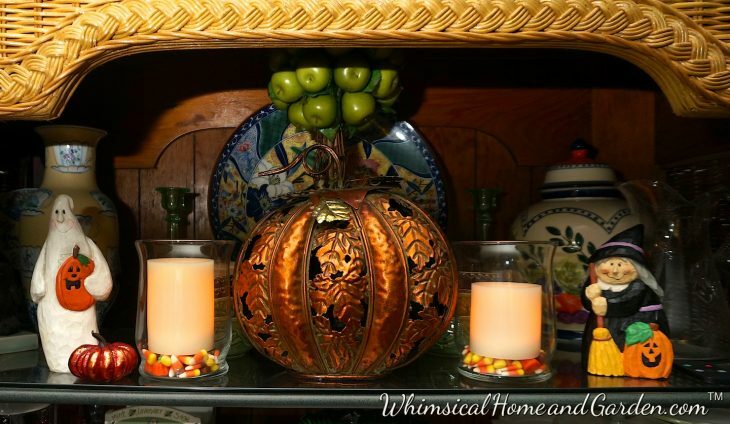 Today – photographs from around my home, decorated with small vignettes for autumn and Halloween. Hope you enjoy. I usually have a vase of flowers by the sink, often cut from the garden. 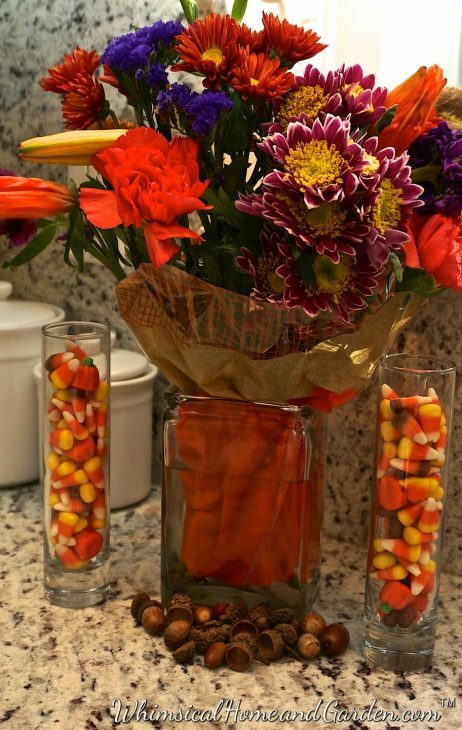 To add some holiday cheer, a couple of stem vases filled with candy corn say it’s autumn. These flowers were from KBJ for my birthday. Left side of fireplace mantle. 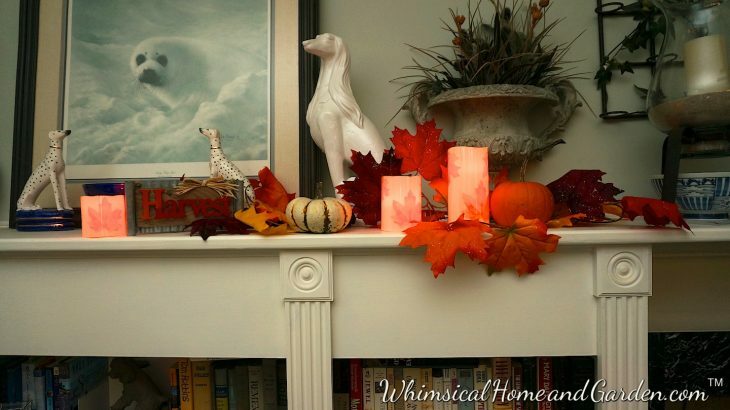 I am crazy for candles, and these are a new set with autumn leaves. I found this copper pumpkin years ago, and it is a favorite. I move it around into a different arrangement every year. The witch and ghost, both carved wood, are also long ago favorites. Both are benevolent and make me smile. This is on the right side of the mantel. 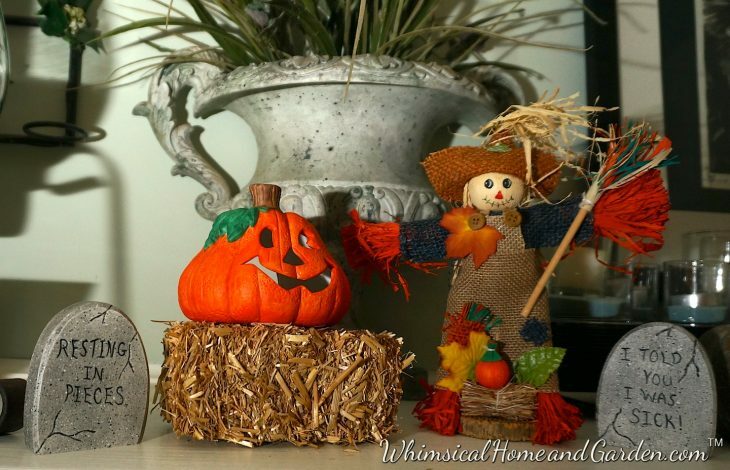 The scarecrow came from the Dollar Store. The two pumpkins came from the farmstand we frequent near our home. What a selection of unusual pumpkins they had. 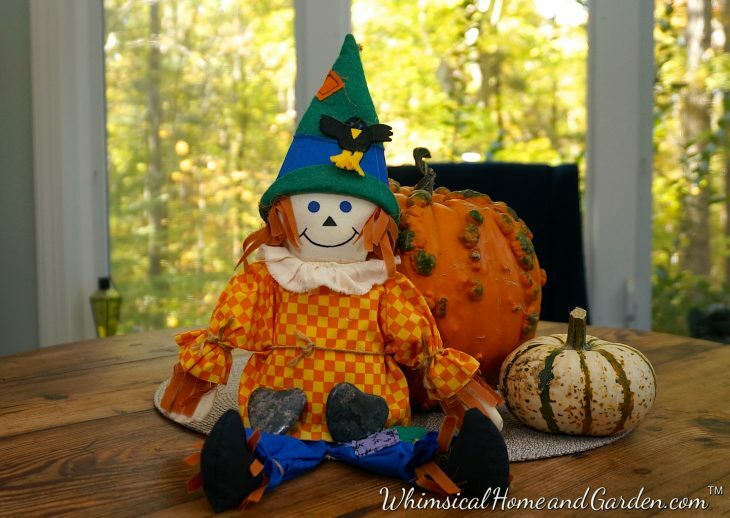 The one behind the scarecrow is one of a new variety of colorful pumpkins like I had never seen before. This arrangement sits on the lazy susan on the kitchen table. 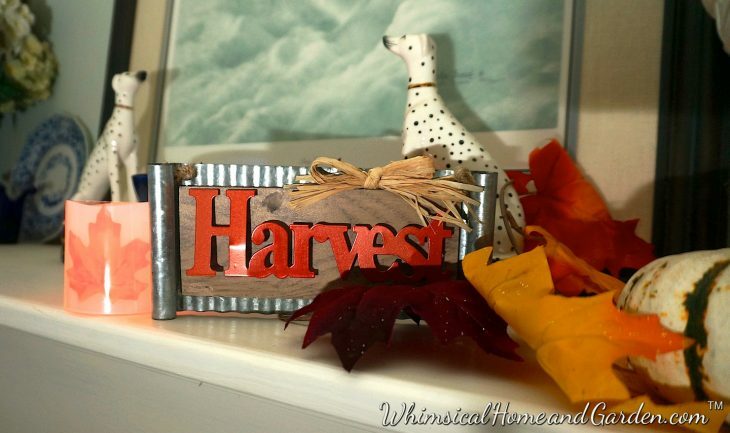 This sits on the hunt board in the dining room, in front of the window, looking out to my garden house. 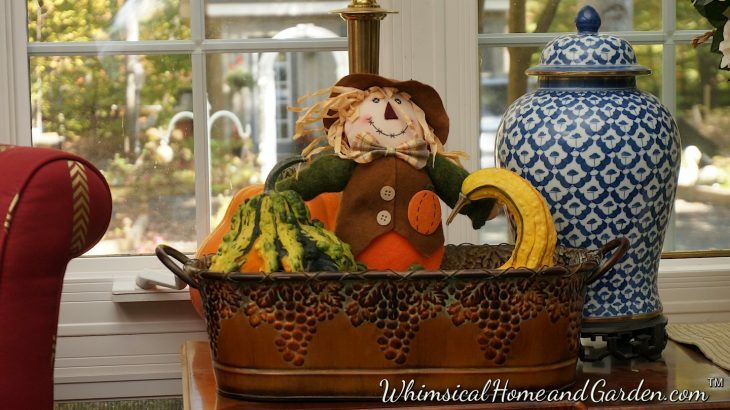 The gourds, which also came from the farm stand add a little bit of whimsy. 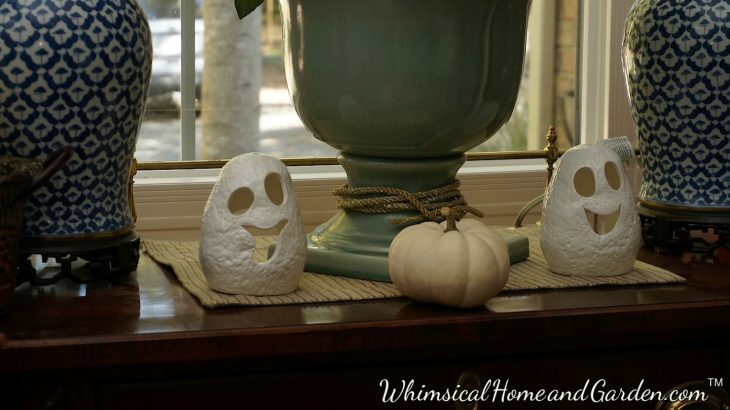 A pair of Casper like ghosts, also sitting on the dining room hunt board. At night I can light the tiny tea candles inside and they look adorable. 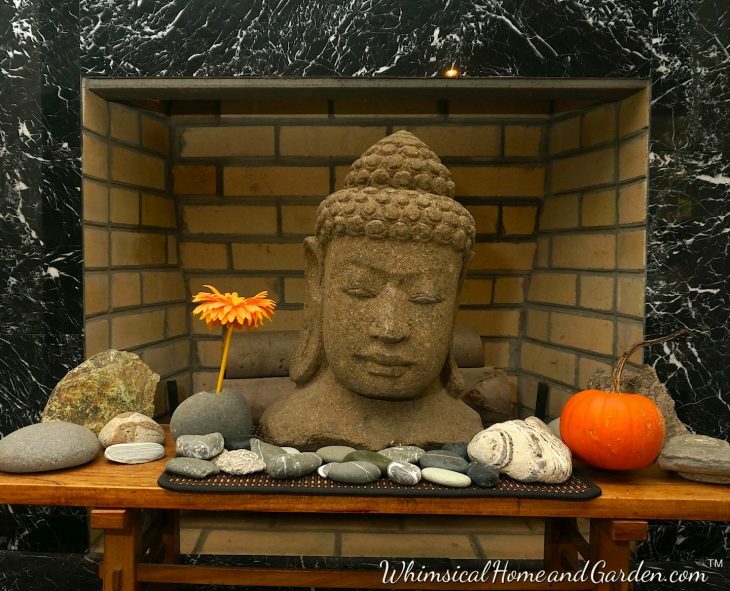 In front of the fireplace opening, even Buddha gets a little bit of pumpkin action. The rocks are mostly from Bali, the New England Coast, and coastal California. It has been a weird fall. 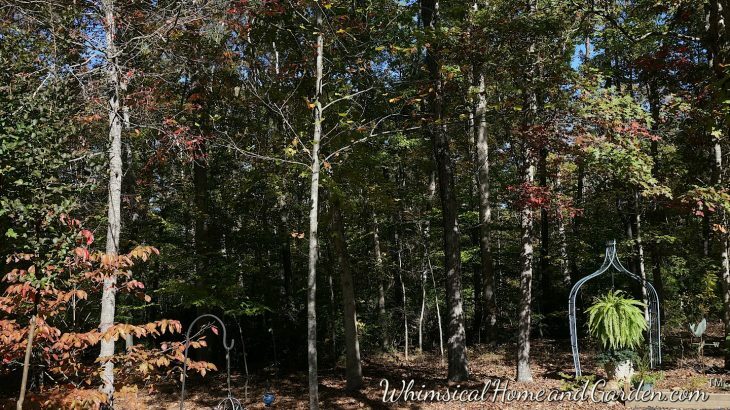 I really did not decorate until a couple of weeks ago, I was still watering and working the gardens, as temperatures were abnormally hot, trees still green leaved, and frankly it did not feel at all like autumn. My birthday is mid October, which is usually peak color. For the last several years the color has matured much later. Below are three photos taken today, and you can see the trees have some distance to go in developing color. We are expecting some much needed rain this weekend, so perhaps that will help. I still feel blessed that I have lost just trees, shrubs and flowers when this year, so many have lost so much more. My heart has been in a state of constant ache with all our country is and has endured. I have never longed for peace, and contentment for our country and the world more than I have of late. I took these next 3 photos just a couple of hours ago so you can see how little color we have. I already pulled all the impatiens from the ground but have left the pots and ferns for a killing frost. So happy to see you back here again. I’ve missed you and your projects. You always inspire me. Thanks Margaret. I am happy to be back!I will try hard to keep the inspiration coming. Lots of projects going on for sure. Great job on your mantle! That’s the nice thing about having fireplaces, they look so wonderful for autumn and Christmas. I too decorate my mantle.. Brings joy to me and the grandchildren love it!! thank you. The mantle in the great room spans the entire width of the room. I do need to do a post on the entire mantle and the challenges it presents because it is 2 ft. wider on one side than the other. Long story. I agree though, that it is fun to decorate them for the holidays, and they really can be a major focal point. So glad you are back up and running. My coffee just hasn’t been the same without your blog to accompany it. It was one thing to hear about the trees you lost but to see the pictures just broke my heart. Like you, I love my little garden and hate to lose anything. Love the blog it always inspires me. Keep them coming 😊. Thanks Carole. 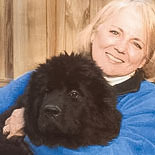 Losing them was sad, especially large ones like these. Two years in a row we had to take down way too many. We finally had a real soaking rain today, the first in months. Hopefully that will revive some of the smaller ones. Thanks for the comment and I will endeavor to inspire some more!